The Rod of Aaron was created by God on the sixth day and given to Moses' brother Aaron. At some point in time, the Rod came into possession of Crowley, who kept it stored in his secret lock-up. It is one of the objects known as a Hand of God. Crowley absorbs the power from the Rod of Aaron. 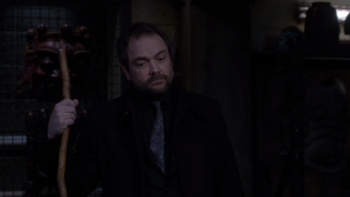 Crowley, after escaping the Needham Asylum and Lucifer, went to his private storage locker. He took Simmons, who revealed herself to be one of Crowley's remaining followers, to show her a weapon that may be capable of defeating the Darkness. He reveals that he has the Rod of Aaron. How he was able to obtain the Rod remains unknown. Crowley revealed that he never realized that it was a Hand of God. The Rod is revealed to be a Hand of God. When Lucifer tracks Crowley down to Crowley's Lock-up, Simmons revealed that she convinced Crowley to lead her and Lucifer to the Rod of Aaron. Lucifer planned to use it's power to kill Crowley. 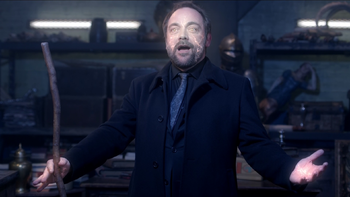 Crowley retrieves the Rod before Lucifer and planned to use the energy it contains to destroy Lucifer, but Simmons leapt in between them and took the hit. Crowley wanted to use the power to kill Lucifer, but he did not know that the Rod's power was completely drained. Unable to kill Lucifer himself, Crowley flees and leaves the Rod behind. Aaron's rod, like his brother Moses' staff was endowed with great power during the Plagues of Egypt. In the Bible, there are two known displays of the rod's power. The first is during the meeting with the Pharaoh and Moses, it is Aaron who throws down his rod that turns into a serpent and devours the other snakes created by Pharaoh's high priests. The other was when the rod was used to prove the tribe of Levi were worthy of becoming priests, as "it put forth buds, produced blossoms, and bore ripe almonds." It was mentioned in many Hebrew texts to be hidden inside the Ark of the Covenant. This page was last edited on 17 July 2018, at 01:48.